As usual, we’ve prepared a summary chart, with the most important analysis updates spliced in. Some of the comments have been redacted for brevity’s sake, the space in the chart is limited, as is quite evident. Please click the chart to open a full-size version (opens in new browser tab). Let’s have a look, point by point. At the end of December 2016 as you can see by point #1, our technical systems still flagged AEX as overbought, and the index initiated a fairly complicated sideways formation not long after, which lasted slightly more than one month. Then on the 7th of February 2017 (#2), one day before the correction actually ended, our analysis suggested more upside remaining in the AEX. However, at the time, we did not expect a big upside move to unfold, but rather a more modest one. So, while this call did pan out in the short-term, we didn’t get the size of the advance correctly. Then on the 1st of March (#3), our systems flagged AEX as severely overbought, which is quite uncommon. What happened? Well, the index did correct slightly for 5 trading days in total, before advancing again, which we at the time weren’t certain would occur. Another decent call, but still, the specifics of the unfolding pattern remained unclear to us. On the 13th of March (#4), there was yet another “extremely overbought” reading registered, and we warned that “this [is] a very questionable spot for new positive positions”, which turned out to be a fairly good call. The AEX proceeded to trade choppily sideways for more than a month, making it difficult for anyone not skilled at short-term trading to make Money in the index. On the 28th of March (#5), the market structure started suggesting a powerful move upwards would unfold at some not-too-distant point in the future. 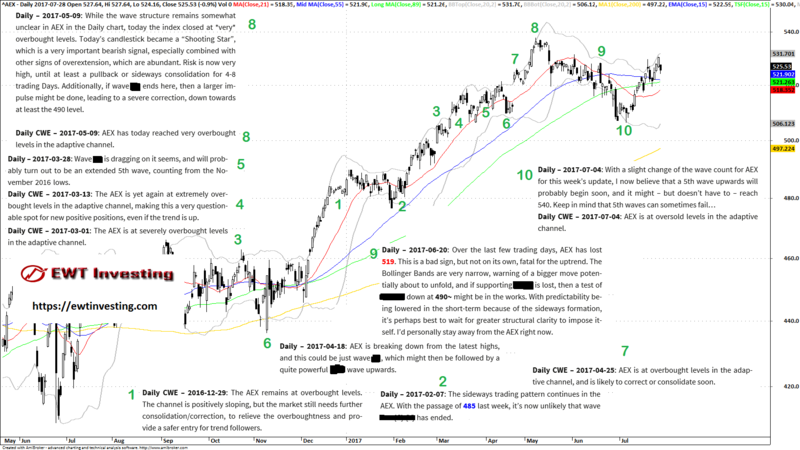 On the 18th of April (#6), the day the AEX hit the first bottom in what would two days later turn out to be a double bottom, we suggested that this was probably just a final corrective wave, before a “quite powerful /../ wave upwards”. That turned out to mark the bottom of the month-long corrective phase, and the AEX advanced strongly shortly after that. On the 25th of April (#7), after a gap up, we warned that an overbought condition had developed, and the AEX did slow down and correct slightly for 3 days. On the 9th of May (#8), we warned that extremely overbought conditions had been registered in the AEX, and that risk was very high. We also warned of a large correction incoming. Was this an excellent top call? Well, on the 3rd of May, in a preceding AEX update which there isn’t space for in this chart, we expressed some uncertainty about the sustainability of this move, and that it was likely drawing close to an end. That was actually a fairly good call in retrospect, but, the AEX did advance almost an additional +2% after our call on the 3rd of May, before actually topping out fully. We can however take credit for offering a very clear warning about very high risk on the 9th of May as shown at point #8, and we turned out to be right about a large inbound corrective formation, although it didn’t go as low as 490 as originally envisioned by us. More on that later. On the AEX analysis update for the 20th of June (#9), we warned that an important critical level had been lost, and that we would personally stay away from the AEX index at the time. This turned out to be a great call, as the index proceeded to trade down considerably over the next 15 days. Then on the 4th of July (#10), we called for a strong 5th upwards to start fairly soon, with a quite likely minimum target at 540. Just a few days later, the AEX made a shake-out double-bottom with a hammer candlestick very close to our call, and then proceeded to advance upwards towards the end of July, as is evident in the chart. We’ll see if 540 can be tagged by this advance, as suggested by our analysis, it isn’t necessary, but it is quite probable. Our Elliott Wave Theory technical analysis work for the AEX index during H1 2017, turned out to quite well. But, during the first 2 and ½ months of 2017, we somewhat underestimated the strength of the formation in the AEX, expecting a more compressed move, leading us to call for less upside than actually occurred. However, from the mid of March, our analysis work for the AEX became more accurate. We managed to forecast the market moves better, calling an end to the April correction and forecasting a considerable upwards move which did manifest. We warned of very high risk very close to the top, and got it right that a big correction would follow (but it didn’t hit our initially proposed 490 zone). We more or less nailed the final shake-out panic low of the correction, and in the beginning of July, suggested a powerful 5th wave would follow, which it did. Unfortunately, we didn’t get everything 100% right. We don’t have a crystal ball. We just work extremely hard for our subscribers, every trading day, year round. Our Elliott Wave Theory technical analysis work on the AEX Index, is part of our Global Elliott Wave Coverage subscription service.